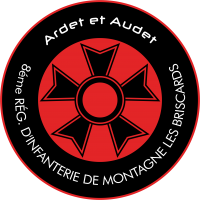 "Ardet et Audet" (Burns and dares) Motto of the 8éme Régiment d'Infanterie de Montagne. "You think they have been placed in that freezing hell because they are the only elite troops able to endure it? No... truth is they have been sent so far because that is where they can cause the least problems..."
Briscard: French derivative word from "brisque", ensign identifying a reenlisted soldier. In the Napoleonic era, the term "briscard" was used to refer to veteran soldiers. The Merovingian’s Mountain Infantry units are integrally based around veterans, experienced soldiers serving a second service. This is because a developed combat instinct is an indispensable requirement to survive the frozen torment which is being posted to the Analogue Mountains, where the environment and climate are as dangerous as the worst adversaries you could find anywhere on planet Dawn. However, the reason for the presence of these troops amongst the Analogue peaks isn't climatology. They haven't been placed there to rescue injured alpinists either. Briscards protect the eastern border of Merovingia against enemy raids. Ancestral home of Antipode warrior clans like the Ice Fangs and the White Knives, considered the most aggressive and dangerous of this savage race, the Analogue Mountains are full of caves, tunnels and mountain passages, appearing and disappearing with the constant avalanches and micro-quakes. At first, the main mission of Briscards was to contain, expel and exterminate the raiding waves of those Antipode clans. 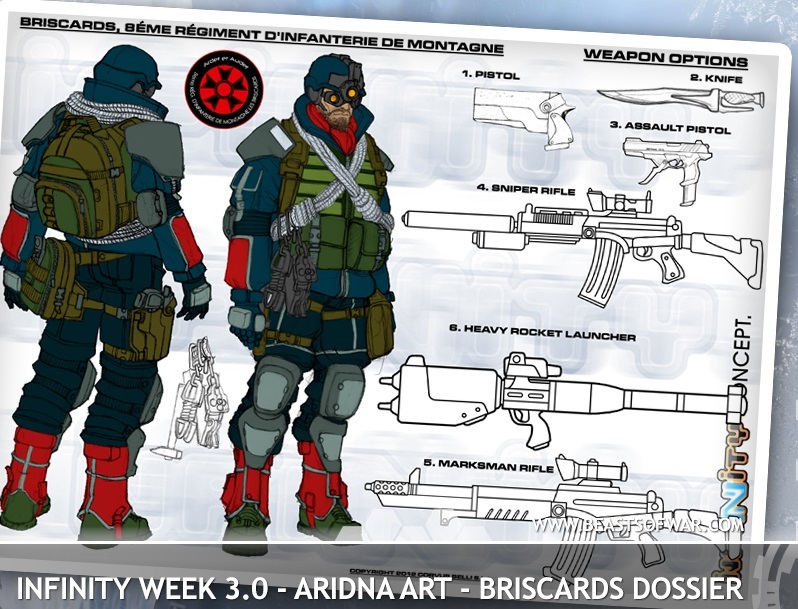 However, since the Ariadnan Commercial Conflicts, they have also had to deal with special operations teams of the Sphere's great powers trying to infiltrate Ariadnan territory on espionage missions They have also tangled with mercenary groups serving mega corporations in the search for valuable Teseum and, more recently, with technified units of [Classified: Insufficient Security Level] origin. Anyhow, none of this worries the Briscards at all. Their operational profile is not like that of any other special unit, who normally specialize in stealth, vigilance and surgical operations. Briscards are not a scalpel, but a hammer. Their standard mission is Search and Destroy; to locate the enemy and eliminate it, so simple and direct, without unnecessary subtlety. To get there fast and hit it hard, that's what is expected from the members of the Force de Réponse Rapide Merovingienne. Those obviously aren’t missions for ordinary soldiers, that’s why the regiment is just based on veteran troops; soldiers who have reenlisted after serving their stipulated service. It's indispensable to be very motivated to accept this assignment. 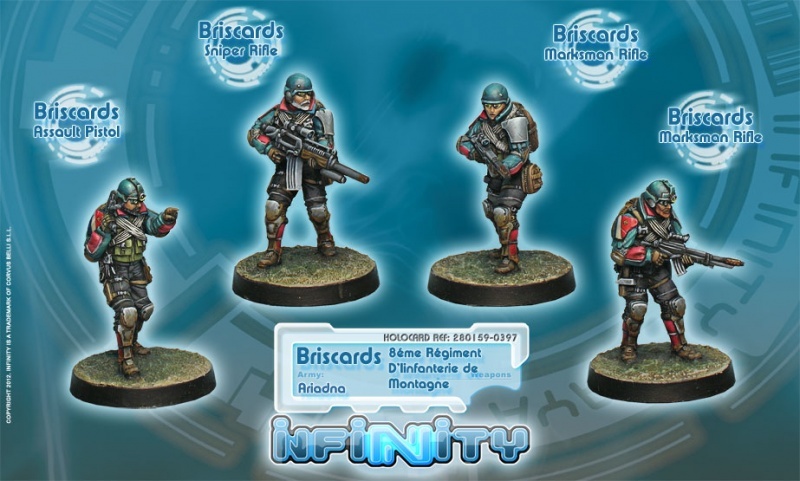 Briscards are those who, after having been demobbed, are not capable of readjusting to civilian life, which they consider a living purgatory for a man of action. These veterans come back to the Army because it is probably the only thing they can do now, the only thing that satisfies them. It is the opportunity to feel again the combat adrenaline which compensates for the harshness of this assignment. Physical toughness is developed due to climate conditions, but psychological fortitude also strengthens as the regiment lives in a perpetual state of orange alert; prepared for any emergency, knowing it has been deployed to an isolated spot on the map without any direct support. 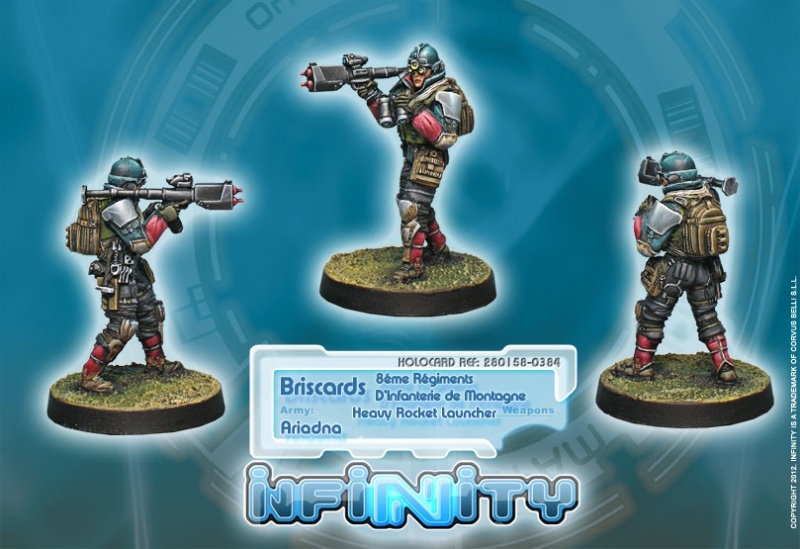 However, as far as they may be from home, and even if they have to sometimes fight just for the honor of their banner, the Briscards are always resolute in battle, symbolizing the true spirit of the experienced Merovingian soldier. This page was last modified on 10 June 2018, at 03:34.